All the hundreds and thousands of dollars that people spend on devices and chemicals designed to eliminate allergens and make their homes smell better — it’s a waste. You need one product to improve the air quality in your home, and it’s the same device that hospitals use to purify air in some operating rooms. It’s the same company that’s been in business for 45 years. It’s not available in the Sharper Image catalog. 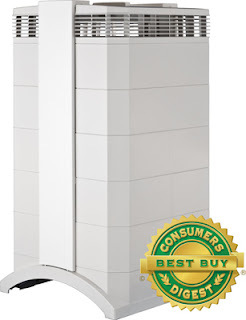 The Swiss-made IQAir HealthPro Plus is simply the best air purifier on the market today or ever. Around 100x more powerful than a traditional HEPA filter, the HealthPro Plus eliminates particles down to 0.003 microns. It strips viruses, pet dander, dust mites, air pollution and harmful cigarette smoke. It allows you to live with a dog or cat despite your allergies. It’s good for asthma, too. Depending on where you live, an air purifier is a must-own device. Save yourself money, trouble, and failure. At under $1,000, this is an investment in your health. I’ve used the IQAir HealthPro Plus for months, and it’s the best air purifier you can own.